The warmer weather has people itching to get outside — especially those who like to hunt what some consider an Iowa delicacy. Iowa State University plant pathology professor, Mark Gleason, says morel mushrooms will start to pop out as the ground warms. “I don’t know if there’s a specific temperature, but this is about the time right now. Some people say when you get bud break on certain types of plants — it depends on the year — this year we’ve been warm and cool,” Gleason says. The warm weather is key along with some rain. “We also have enough soil moisture to push them out of the ground,” Gleason says, “so in dry years we tend to have poor morel stands. In moister, wetter years with more rainfall, we tend to have more.” The temperatures so far this spring have fluctuated, but Gleason says once a warm day pops the mushrooms out, they are there until found or they dry up. “It’s a one way trip. Once they are out they don’t go back in. They’ll enlarge a bit as they come out of the ground and reach their standard size,” Gleason says. “There’s five species of morels in the state and each of those has its own characteristic size The smallest one is probably the gray — which is the first to come out of the ground — and the largest is the last one which kind of a golden color and can be six or eight inches, even larger.” Leaves popping out of the ground are a key signal the morels are there for the picking. Gleason says many people look for dead elm trees as the prime growing spot, but that’s not the only place they flourish. “But also other trees, and that area around the root zone of other trees can work, alive or dead. So looking in woodlands is good, but they will grow in meadows and things like that. But more often they are in association with some decayed wood or buried wood. So, it might be a decayed root or something like that,” Gleason says. You might think asking veteran morel hunters for the best places to find them — but he says the people that are most successful don’t like to share their hot spots. “Most people are very reluctant to do that,” he says. “Unless you are related to them or they like you, it might be hard information to get.” There are a lot of stories or tales about how to help the morels flourish. One is to use a mesh bag that allows the morel spores to drop out as you hike through the woods — providing seed for a new generation. “Well, there are people who strongly believe that. I’m skeptical of that,” Gleason says. “Because, when morels are picked they are very, very young and the spores haven’t formed yet. If you are waiting for a morel to form spores, it’s probably well beyond the age where you’d want to eat it.” If you do decide to give mushroom hunting a try, Gleason says you have to remember they can easily blend into the surroundings. “You kind of have to train your eye to them a bit. They are easy to overlook,” Gleason explains. 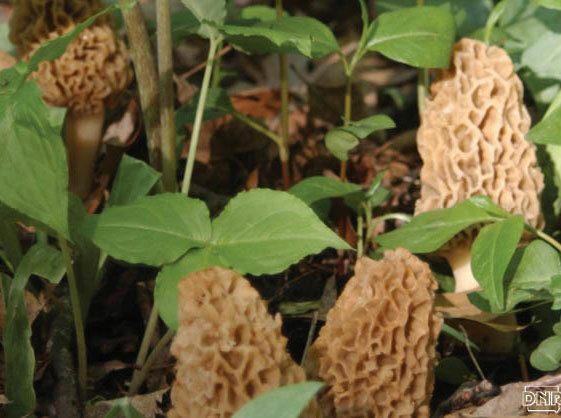 “It’s possible to walk through a wooded area and just overlook the morels. But once your eye gets trained to what a morel looks like amongst other spring plants — then it’s easier to spot.” Gleason says the morel season can vary across the state depending the weather conditions.